These adorable cupcakes are perfect treats for an Easter Egg Hunt party, or a special treat in your child's Easter basket. Use cake mixes and canned frosting to help speed the prep. Preheat over to 350 F. Line a standard muffin pan and a mini muffin pan with paper cupcake holders. Prepare the cake mix according to the package instructions. Fill the muffin cups. Bake the minis for about 15 minutes and the larger cup cakes for about 25 minutes. Remove from the pans and let cool in their paper liners. 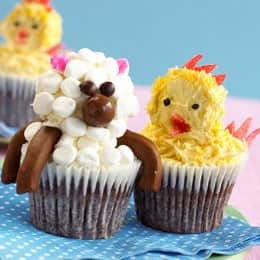 To decorate the chicks, tint the frosting yellow and ice the tops of 6 large cupcakes. Remove the liners from 6 minis and ice the tops and sides. Tint the coconut yellow. Roll the minis in the coconut and place on top of each large cupcake. Draw eyes with black icing. Ice the back and cover it and the top of the large cupcake with coconut. Make combs and breaks from the fruit leather. To decorate the Sheep, ice the tops of 6 large cupcakes. Cut the marshmallows in half using scissors. For ears, dip 12 marshmallow halves, cut side down, into the sugar and set aside. Arrange marshmallows on top of the cupcakes, leaving enough space in the centre for a mini cupcake. Remove the paper liners from 6 minis and ice the tops and sides. Use malted milk balls for the noses, and attach the ears. Place a mini on its side on top of each large cupcake; ice the back and cover with marshmallows. Use M&Ms for eyes. Place two Tootsie Rolls on each side of the cupcake for legs.